Jacques Nielsen was fourteen years old when he was “HALO-Flighted” after a traumatic accident ended his family’s holiday reunion. On Christmas Day in 2010, Jacques and his family were enjoying Christmas festivities in Kingsville, Texas. Family members were in town from all over the world. Jacques raced dirt bikes for several years before his accident and had several housed at his grandmother’s where the festivities were being held. The whole family was enjoying their visit when his aunt’s dog went missing, so Jacques jumped on one of his dirt bikes to go find it. His mother and father heard sirens from a nearby ambulance and collectively thought “that poor family is going to have a horrible Christmas.” A few minutes later, they were being summoned by another family member because it was their own son that required emergency care. Jacques’ sister found him a block away, lying in a pool of his own blood. Jacques took his eyes off the road for a second when he realized his gas line was in the wrong position and that’s when the accident occurred. In that split second when Jacques looked down, he veered right going 35 mph and crashed into a parked suburban. Jacques wasn’t wearing a helmet. Fortunately, the accident occurred in front of a local physician’s home. He quickly called to request EMS and HALO-Flight. 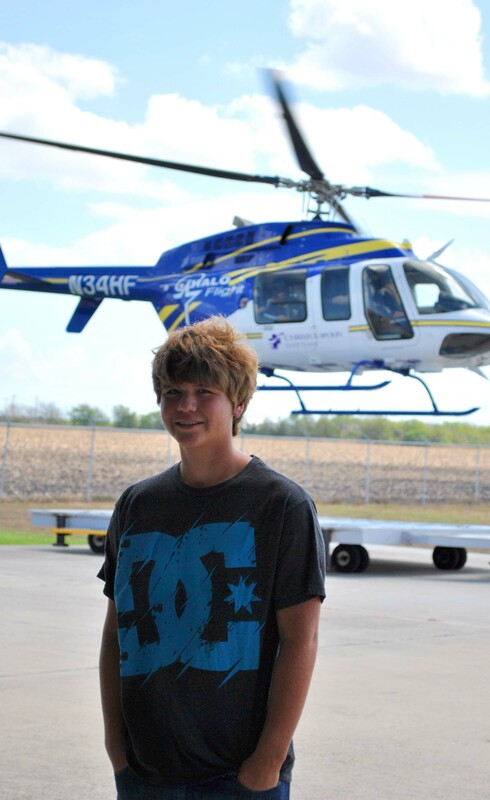 Jacques was put into an ambulance and taken to CHRISTUS Spohn Kleberg’s helipad to meet HALO-Flight’s crew. The flight crew was waiting on the helipad when Jacques arrived. They boarded the ambulance to assess Jacques and quickly determined that the severity of his injuries required them to put him to sleep. A breathing tube was placed before Jacques was loaded into the aircraft. Jacques was quickly flown to CHRISTUS Spohn Memorial and within 16 minutes, he was being cared for by skilled physicians. Jacques underwent multiple surgeries for his injuries. Jacques broke most of the bones in his face, he had an open femur fracture, collapsed lung, and a broken wrist. One doctor explained the trauma to his face as, “all the bones in his face exploded.” Jacques’ mouth was wired shut and he had to eat through a feeding tube for two months. Today Jacques is a happy, healthy and active fifteen year old. He still has no recollection of the events that occurred following the crash until Day 3 when he woke. His recovery is remarkable. On Day 7, Jacques was up walking. Jacques says he’s ‘very lucky’ to be alive. Without Kingsville Fire Department and EMS, HALO-Flight and his physicians care, the ending to this story would not be the same. We had a chance to meet Jacque recently. We are so thankful to have been there in his time of need and to provide critical care until he received the level of care his injuries required. Jacques’ story is extraordinary and is a true testament to the care provided by the air medical community.